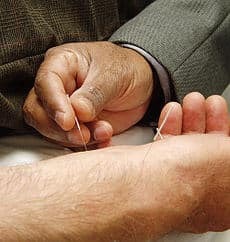 Acupuncture significantly reduces levels of a protein in rats linked to chronic stress, researchers at Georgetown University Medical Center (GUMC) have found. They say their animal study may help explain the sense of well-being that many people receive from this ancient Chinese therapy. Published online in December in Experimental Biology and Medicine, the researchers say that if their findings are replicated in human studies, acupuncture would offer a proven therapy for stress, which is often difficult to treat. “It has long been thought that acupuncture can reduce stress, but this is the first study to show molecular proof of this benefit,” says the study’s lead author, Ladan Eshkevari, Ph.D., an assistant professor at Georgetown’s School of Nursing & Health Studies, a part of GUMC. First biological proof for acupuncture? While traditional Chinese acupuncture has been thought to relieve stress —in fact, the World Health Organization states that acupuncture is useful as adjunct therapy in more than 50 disorders, including chronic stress — Eshkevari says that no one has biological proof that it does so. So she designed a study to test the effect of acupuncture on blood levels of neuropeptide Y (NPY), a peptide that is secreted by the sympathetic nervous system in humans. This system is involved in the “flight or fight” response to acute stress, resulting in constriction of blood flow to all parts of the body except to the heart, lungs, and brain (the organs most needed to react to danger). Chronic stress, however, can cause elevated blood pressure and cardiac disease. The study utilized four groups of rats for a 14-day experiment: a control group that was not stressed and received no acupuncture; a group that was stressed for an hour a day and did not receive acupuncture; a group that was stressed and received “sham” acupuncture near the tail; and the experimental group that were stressed and received acupuncture to the Zuslanli spot on the leg. In a second experiment, Eshkevari stopped acupuncture in the experimental group but continued to stress the rats for an additional four days, and found NPY levels remained low. “We were surprised to find what looks to be a protective effect against stress,” she says.